I hope your summer is going great so far! By which I mean that I hope you’ve had some time to relax by the pool and that you haven’t yet felt the need to give any of your kids away (or if you have felt the need that you haven’t actually followed through with it). 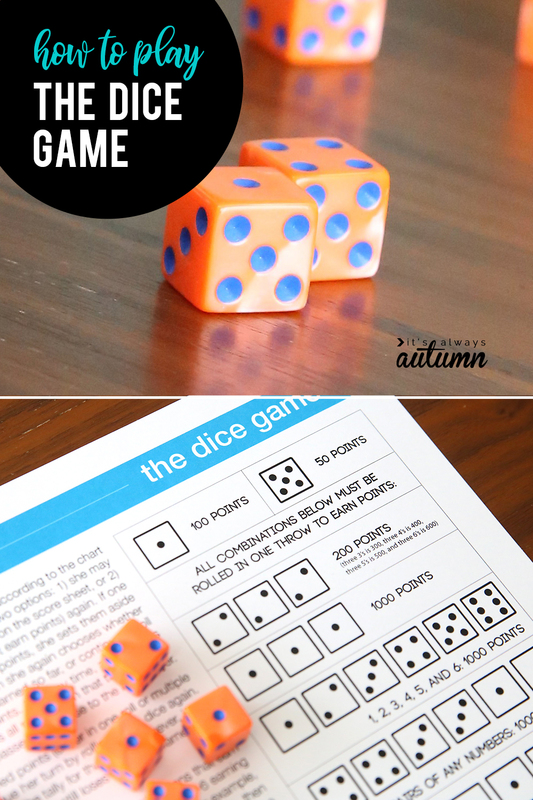 Since we can all use some easy ideas for keeping the kids happy and occupied this time of year, I’ve decided to share one of our favorite games: the dice game. I don’t know if this game has a different name, but growing up we just called it “the dice game.” The name comes from the fact that all you need to play it are six dice, which makes it absolutely perfect to pull out anytime you just really need people occupied for a while. It’s also GREAT for playing on car rides, while waiting around in airports, or even lounging at the beach. 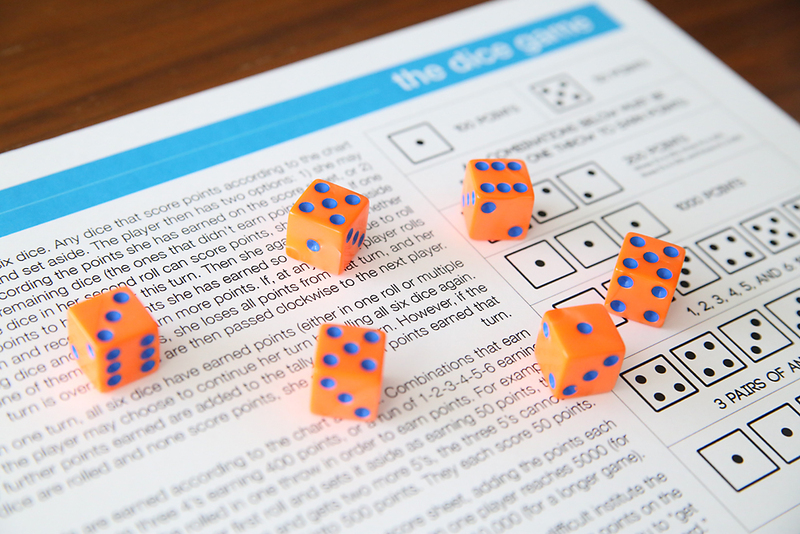 You just need a hard surface to roll the dice on and a piece of paper to keep score with and you’re set. 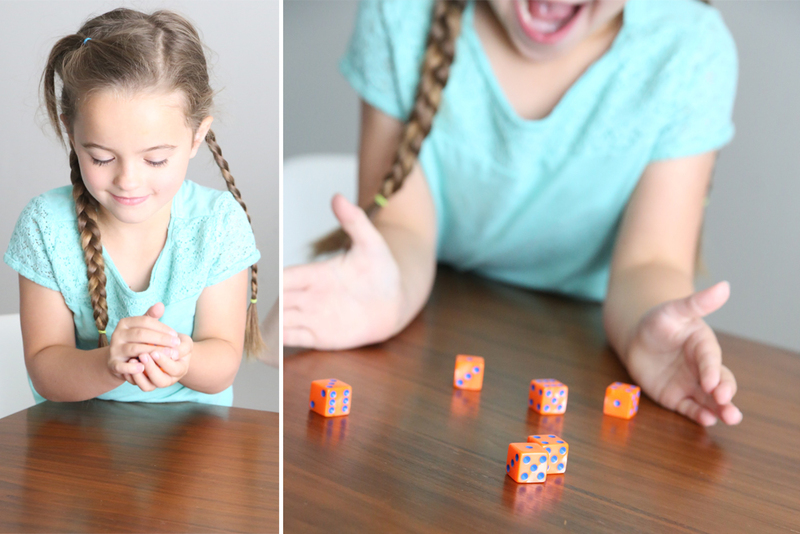 I really like that even little kids can play this game with a bit of help – and every little kid I’ve ever met LOVES rolling dice. The basic premise of the game is this: you roll six dice. 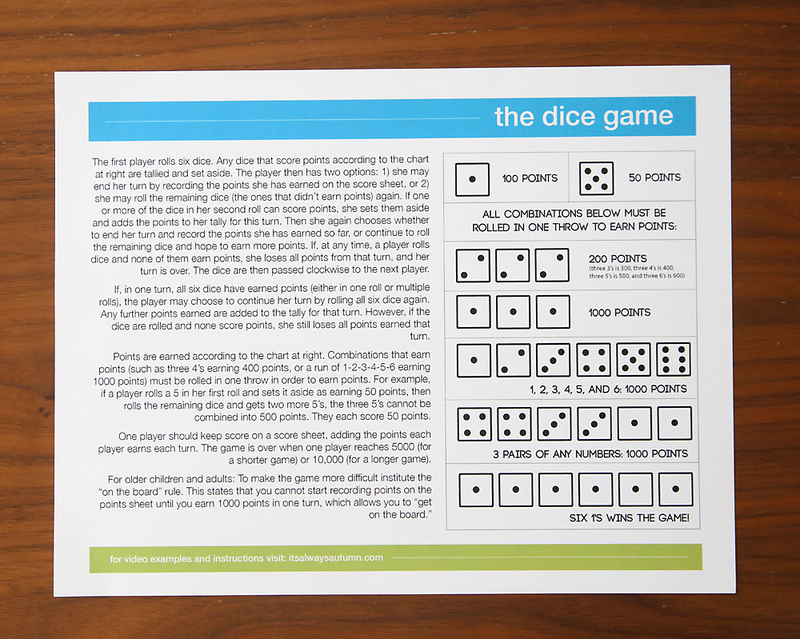 Some combinations of dice will score points, while others don’t. You take out the dice that have scored points and then decide whether to keep that score, or re-roll the remaining dice to try to score more points. But if you roll again and don’t score points, you lose what you’ve earned so far. So the game moves quickly and there’s an element of risk that makes it really fun to play. I’ve created a free printable instruction sheet and scoring chart, which you see below. You can download it by clicking here. 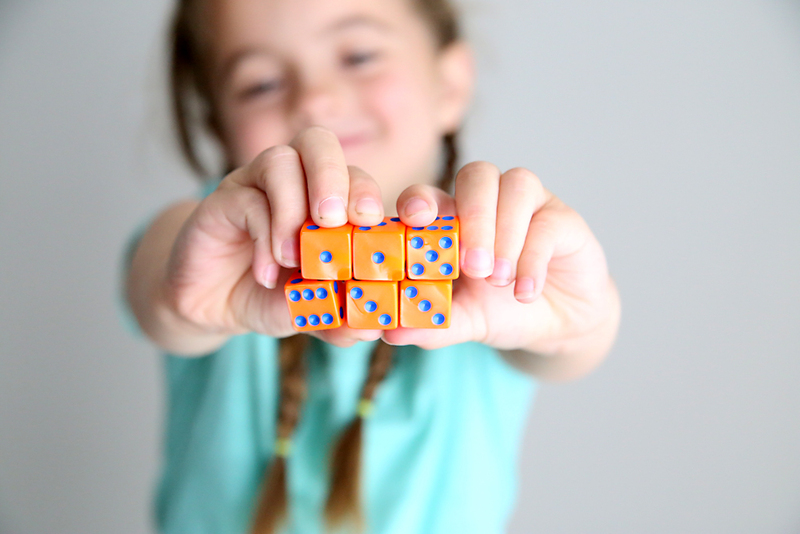 And if you’d rather watch directions instead of read them, I’ve also made a video that walks you through all the rules and different scoring combinations, so you can get playing with your kids in no time. This is awesome! I always forget how to score! Love that you made a printable for this! My family called it “bones” growing up. So fun that other families know about it too! so is it like yahtzee? when my daughter was little we had a great dice game book. i wish i knew where it went!! WOW, Thank you so much! You have just solved all my Christmas Gifts for everyone. This game, in a homemade drawstring bag ( with instructions ) and a gift card of choice wraps everything up, All neat and tidy. I can’t wait to get started. We call it farkle too, been playing it for more than 30 years. Can’t tell you the number of dice sets I’ve worn the corners off! Another Farkle player!!! As kids we could not wait to play with the adults. Kids played like you have it here. The adults all had baggies of pennies! They would have to put one penny in at jar in the middle, the winner of the game, got all the pennies!! I have a shoe box full of “Farkle” pennies, in little baggies with each of our family’s names! Even those who have passed away. I don’t have the heart to empty their penny baggies! This is perfect for our upcoming travels. Thanks so much. We called it “Ten thousand”. There is also a set of cards you used to be able to by to be played with the dice called “Fill or Bust”. I too have played it for many years. We play it with 5 dice and have to get 5,000 points. I always have dice in my purse! Thanks for the cheat sheet, it is so much better than just trying to remember the rules! You can also get the board game Risk and Roll 2000 which is pretty much the same as this. They add a card element for each turn which gives different events (such as two’s are worth 20, no harm no foul, don’t roll out and you can take away 200 from anyone’s score). Lots of fun, my kids at work really enjoy it! I grew up playing ‘dice’ with a few differences. We play with a small straight (1,2,3,4,5 or 2,3,4,5,6) being worth 1,500 points and a large straight (1,2,3,4,5,6,) being worth 3,000 points, as long as they are all rolled in the same throw. One more difference was the opportunity to score on the previous player’s total. This really changes things up. Once you are ‘open’ you have the option of rolling the dice that the immediately proceeding player didn’t use to score. This cannot skip players. For example, if the next player in line isn’t open, decides not to take the chance, or doesn’t roll a counter the opportunity is lost for everyone else. If you score it adds onto the score the previous player took. Ex. Billy scores 1,000 leaving 3 dice on the table. the next player is open and takes the 3 remaining dice. They roll a five (50 points). If they hold they score 1,050. Play continues according to the original rules. This has actually made it all the way around the table with each player scoring additional points. Due to the increased scoring opportunities, the game is over at 25,000 points.